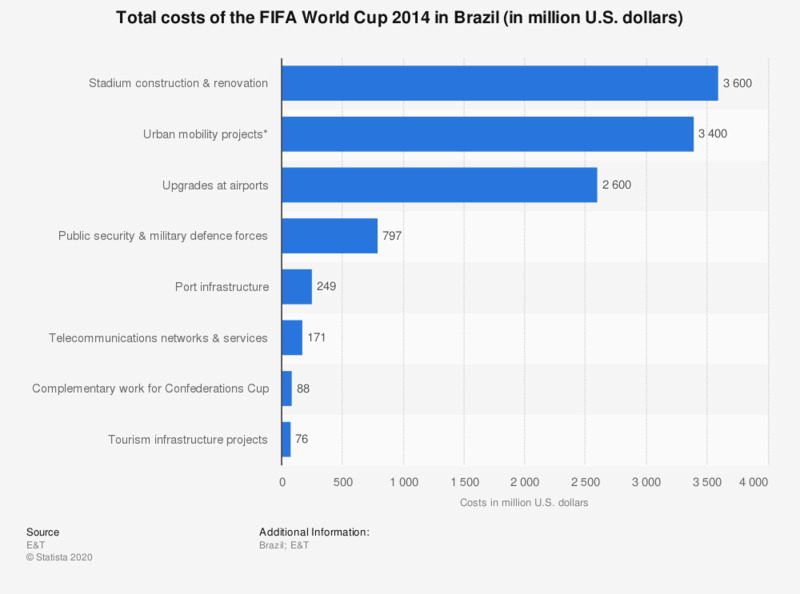 The statistic shows the estimated total costs of the FIFA World Cup 2014 in Brazil, including the costs for stadium construction and renovation, urban mobility projects, upgrades at airports, public security and military defence forces, port infrastructure, telecommunications networks and services, complementary work for the Confederations Cup and tourism infrastructure projects. The costs for stadium construction and renovation are estimated at around 3.6 billion U.S. dollars. The 2014 World Cup in Brazil cost an estimated $11.6 billion. Less than 15% of this cost was covered by private investors, with the rest of the funds coming from federal and state budgets. These figures were updated on average every nine months by the Brazilian government since they were first published in January 2010. The biggest costs in the 2014 World Cup were the stadiums and the Urban Mobility Projects, which included improvement to the road and transport networks as well as integrated monitoring systems for all host cities. Of the 12 host cities, five had brand new venues built specifically for the tournament while the Estádio Nacional in the capital, Brasilia, was demolished and completely rebuilt. The remaining six stadiums were extensively renovated in preparation for the World Cup. With an estimated one million foreign tourists visiting Brazil during the month-long event, substantial investment was also needed in the country’s airports ($2.6 billion) and public security systems ($797 million), as well as in tourist infrastructure projects ($76 million). Despite the extensive publicity and income that a World Cup generates for a host nation, with such high costs that ultimately have to be covered by the federal government, it is unsurprising that, before the start of the World Cup, 61% of Brazilians thought that the tournament would be a bad thing for Brazil. * Such as bus rapid transit systems, road corridors, stadium access improvements and integrated monitoring systems for all host cities. Everything On "FIFA World Cup 2014" in One Document: Edited and Divided into Handy Chapters. Including Detailed References. Statistics on "FIFA World Cup 2014"
How would you describe the current economic situation in Brazil - is it very good, somewhat good, somewhat bad or very bad? What kind of influence are the following institutions etc. having on the way things are going in Brazil? Do you approve or disapprove of the way President Dilma Rousseff is handling each of the following areas? In your opinion, what kind of impact will the World Cup have on Brazil's image around the world?